Was on my list of book series I wanted to read. But the list just gets longer as more and more books are added, and few get read. 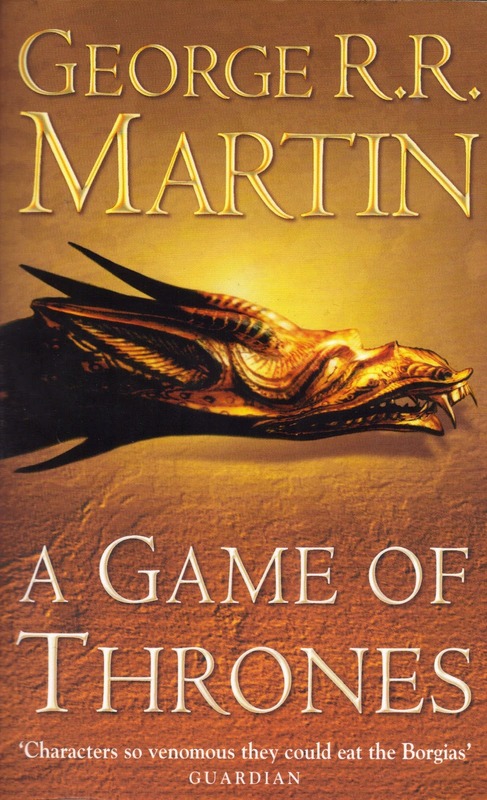 And so it was when I heard that HBO was making a television series based on the books. Of course, I found this out because I was looking to see what the next thing coming from HBO would be, and had secretly (maybe not secretly) wanted them to try their hand at science fiction or fantasy. Give it their quality edge. So, I released that I’d have to actually read the books. Time passed, and I became aware the series was about to start and I still hadn’t got around to reading it. So I set out to buy the books. Four bookshops it took me to get it and trips all over town. But I got it. And managed to remain about 2 episodes ahead of the show (and it was pretty obvious where the episodes where going to end). But that’s about me, not the book. A Game of Thrones isn’t your usual fantasy. It’s not a hero with a sword defeating dragons and finding magic items. It’s history brought to life in a fantasy setting. As any fan will tell you you never know who’s going to die next. Each chapter is written from the point of view of a different character (or rather a different one of a handful of characters). The ability to inhabit different characters lets you see the world and events in a multitude of ways. It allows things to be hidden and revealed and conflicting unreliable narrations. At first when everyone’s at the Stark’s castle Winterfell the books tells the story passing from POV to POV to tell the next part. But as the main characters separate the story jumps around a bit more. And although Martin uses the format well, this is where the book really annoys. Chapters start slow a build to a crucial point, then stop and move on to the next character. And frustration hits. You’re not interested in this character’s story right now, and anyway, it’s a bit slow. You want the hear what happens to the last character. You can’t skip ahead to the last character’s next chapter – what if you miss an important bit of the puzzle. But then the current character’s story becomes interesting again and… next chapter. It’s a trick, and annoying trick to leave the reader wanting more. And it works so darn well. LOL! An annoying trick that works so darn well. Ha! Rob is on the waiting list for the library’s audio e-book of the first book of the series. I know he likes listening to audio books and thought this might be a way he and I could share the joy of reading. I read the first book after season 1 and before season 2 so I could brush up on all that had already happened. Then last year Rob gave me the four book set (yes, there were 5 books at the time but he’s perverse and only gave me four of them), so I had to read ahead. I’m glad I did. Very glad. I use audiobooks to help me get to sleep. Since then I tried to listen one properly (while not in bed) and… fell to sleep. I’ve ruined that avenue for myself.